Mrs Best Beer HQ and I spent our fifth wedding anniversary in Raglan, Waikato’s sun-soaked surfing mecca. Not that we did any surfing; it’s way too cold for a wimp like me, and my wife is eight-months pregnant with our first child. 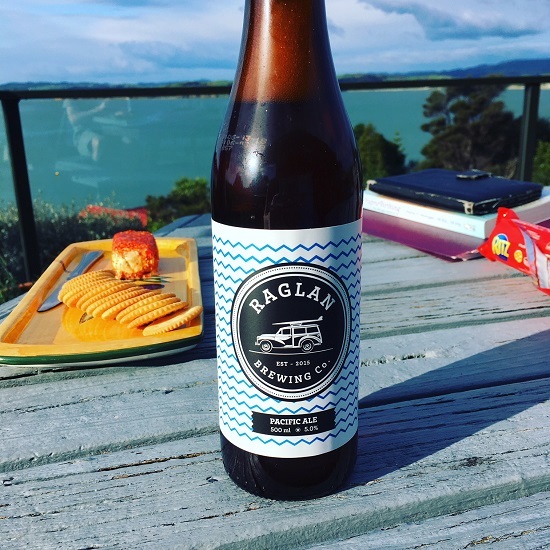 Thus, I was drinking to Best Beer HQ Jr. and five years of marital bliss when I cracked open this bottle of Raglan Brewing Co.’s Pacific Pale Ale, which I’d purchased at the local SuperValue and taken back to our brilliant B&B – look at that stunning view! We dry hopped this baby for a big favour and aroma. It has just enough bitterness to get your attention and finishes with a crisp end note. The best ingredients were selected from different parts of New Zealand, then cooked up by our brilliant brewer with great love and care. The review: With a long blurb on the bottle, it doesn’t leave me with a heck of a lot that I need to tell you. It’s right – it is like summer in a bottle, thirst quenching with sweet tropical flavours (pineapple, peach, and mango). I’m not sure I’d describe Raglan Brewing Co.’s Pacific Ale has having a “super hoppy property”, though, because to me that sounds like it’s a powerful, hop-forward beer, when actually I’d argue that it’s a finely balanced beer. It’s certainly no IPA or APA. Beer/movie combination: I love horror movies almost as much as I love sunshine, beers, and the beach – plus it’s nearly Halloween, so I’m going to recommend a scary movie this week. You should definitely check out Netflix flick The Ritual, which is about a horrific camping trip in northern Sweden.